Flint, Mich. – The Wichita (Kansas) Thunder, ECHL affiliate of the Edmonton Oilers, have signed Flint Firebirds’ defenseman Hakon Nilsen to an amateur tryout agreement (ATO). Nilsen is expected to join the Thunder prior to their home game this Saturday, Mar. 23. Nilsen, 21, turns pro after playing for the past four years with the Firebirds. The Cape Coral, Fla. native improved statistically each of the four seasons he was in the OHL. He nearly doubled his point-production this season, recording a career-high 14 points (3G, 11A) in 68 games, including one power-play goal and 38 penalty minutes. He played in a Firebirds’ franchise-record 217 games, scoring six times and adding 26 assists for 32 total points in that time. 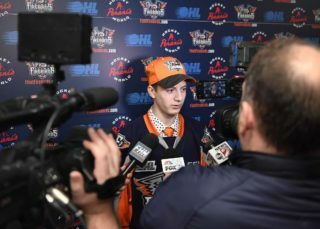 Nilsen, a 6-foot-2, 205-pound skater, was also nominated as the Firebirds’ College / University Excellence Award winner after earning 66 college credits and a cumulative GPA of 3.60 during his third season in Flint. Nilsen joins forward Ty Dellandrea as the latest Firebirds to be called up to the professional ranks since Flint’s season ended this past Sunday. The Wichita Thunder are a minor league affiliate of the NHL’s Edmonton (Alberta) Oilers and the American Hockey League’s (AHL) Bakersfield (California) Condors. 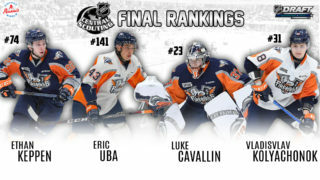 Since the Flint Firebirds’ inception four season ago in 2015, the club has had 15 drafted or NHL signed players on its roster consisting of Will Bitten (Montreal), Dennis Busby (Arizona), Nick Caamano (Dallas), Connor Chatham (New Jersey), Ty Dellandrea (Dallas) Fedor Gordeev (Toronto), Kyle Keyser (Boston Bruins), Nick Mattinen (Toronto), Brent Moran (Dallas), Alex Nedeljkovic (Carolina), Alex Peters (Dallas), Vili Saarijarvi (Detroit), Kole Sherwood (Columbus), Jalen Smereck (Arizona) and Josh Wesley (Carolina). 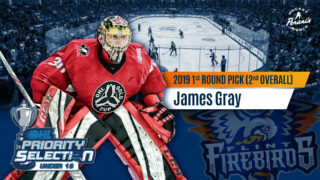 Early bird ticket packages for the Flint Firebirds’ 2019-20 OHL season are on sale now. A $50 deposit reserves your seat for next season! The special early bird price deadline is Tuesday, April 30th and fans can secure their seats for next season at the Dort Federal Event Center Box Office from 9 a.m. to 5 p.m., Monday thru Friday. For additional pricing and ticket information, fans can call the box office at (810) 744-0580 or email mary@dorteventcenter.com.